Stern definitely opened my eyes to topics and careers in accounting and financial services that I never knew existed. With a bachelor’s degree in accounting and real-world experience through multiple internships, Master of Science in Accounting alumna Carolina Cuello knew exactly what path she wanted her career to take. 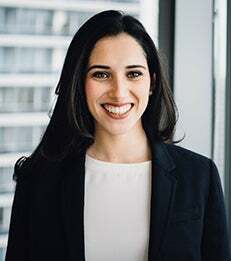 In researching graduate programs, Carolina wanted an education that would not only prepare her thoroughly for the four-part Certified Public Accountant (CPA) exam, but also hone her understanding of the field and its importance in public policy, market performance and business operations. Professor Alex Dontoh, deputy chair of NYU Stern’s Accounting Department and faculty advisor for the program, echoed Carolina’s sentiments, highlighting the value of intersecting academic and professional perspectives throughout the master’s degree. "The M.S. in Accounting offers both sides of the equation: highly qualified faculty and experienced practitioners who can help students achieve the next level for their learning and application of accounting principles." By leveraging their professional networks in this way, the faculty introduced Carolina’s cohort to complementary areas to expand their knowledge of business and financial markets through such classes as Corporate Finance, Financial Modeling and Forensic Accounting. Drawing on their experiences, Professors Paul Zarowin, Dan Gode, Anthony Marciano and many others challenged students to explore how events such as presidential elections, IPOs and high-profile mergers can impact larger policy decisions, regulation and their own daily practices. NYU Stern’s Master of Science in Accounting, which launched in May 2015, allows college graduates with a business or accounting major to satisfy the course requirements for New York State’s CPA certification. Because of New York State’s stringent standards and reciprocity with other states’ certification, graduates of this program are well-prepared to meet CPA requirements in other states such as California, Texas and Florida. The MS in Accounting provides a thorough foundation for careers in accounting, including attestation and assurance services, as well as taxation and forensic accounting.